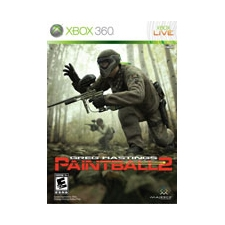 The most successful name in paintball games brings a host of new features to Xbox360 with Greg Hastings Paintball 2! Brave the elements in the unpredictable outdoors in this intense first-person paintball experience. Get up to 20 friends together for fast-paced multiplayer action! Test your skills in brand new scenario modes, manage a team of skilled players, master a variety of new weapons, and more! Explore new terrain in 62 exciting paintball fields. Travel all over the US and Europe for a global paintball experience. Up the ante with game-altering weather settings and hazards, such as rain, fog, wind, mud, and paintball tanks! Players choose their path to glory in Tournament Speedball, Recball, and Tournament Woodsball, competing in 40 diverse events. Equip your team with a wide selection of markers, goggles, jerseys, and accessories, as well as the latest special weapons such as pump guns, pistols, paint grenades, and paint rocket launchers! Check out your teammates' trading cards as they win games, increase skills, and buy gear. Featuring hundreds of real-life professional and amateur players from dozens of teams. Unlock special abilities to play like the pros! Win tournaments to earn cash for new gear, players, and skill upgrades!